Three days after The Dandy Warhols finished recording their ninth album, Distortland, a 14,000 lb gush of water collapsed the roof of the Dandy’s studio, filling the place with rainwater and 80 years of roofing materials. Had it happened a few days later, the Dandy’s would have been on tour and the two months of humidity which ensued would have wrecked every last piece of gear. Well, as any good comedian knows, timing is everything. “Our whole thing is a disorganized byproduct of being alive,” says Taylor-Taylor. “So our music is organized disorganization.” Indeed it is – the Dandy’s have always spectacularly blended the pristine with the unusual, the rhythmic with the unpredictable, the grit with the sheen. Since their inception in 1994, they’ve sailed through and past shifting musical climates by presenting thoughts un-mired by censorship and unfiltering their art. 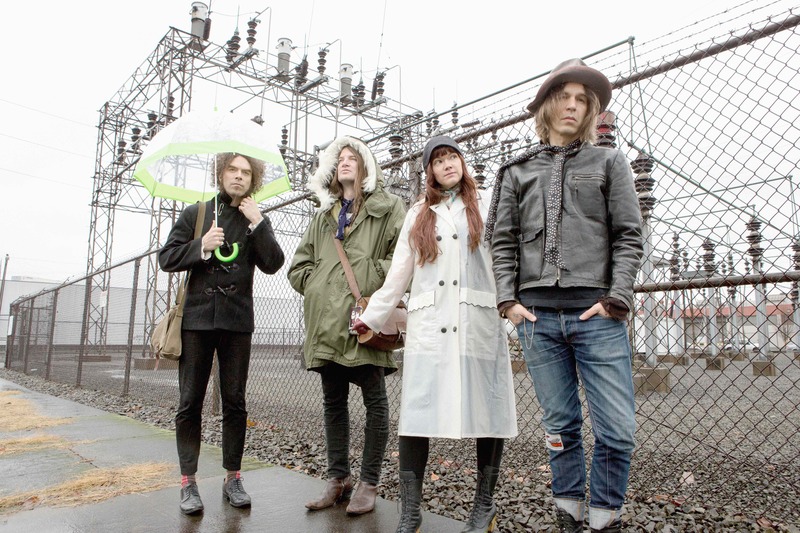 Making music out of Portland, Oregon for over twenty years, The Dandy Warhols – Taylor-Taylor (vocals, guitar), Zia McCabe (keyboards), Peter Holmstrom (guitar), and Brent DeBoer (drums) — have gone on world tours, had hit singles and even taken the stage during the Greek riots. They’ve weathered shifts from vinyl and tape to CD and CD to digital, from paper fliers to social media and toiled with major labels, and still remained a pure synergistic unit. Distortland, in a way, was an act of serendipity before disaster – before the throbbing rain could have ruined all the Dandy’s progress – but it’s also an album about the lack of serendipity after a much more subtle disaster set in. Living in Portland well before it became the destination-du-jour, they’ve seen their home change around them: from a community where artists can thrive to one where a bottle of green juice costs more than a concert ticket. Their every day reality began to look a lot different than it did back in the early nineties, overrun by corporate development and gentrification – a distortion of the very environment the band knew and loved. And maybe it was a coincidence that the sonic path of the album began to mirror that scuffed, blurred vision – or maybe not. Indeed, “You Are Killing Me” edges rough vamps against a hooky refrain that is instantly danceable and chantable without being the least big cloying – something the Dandy’s have always been expertly skilled at, teetering their songs on the balance line of noise, rock, and pop without every tipping too heavily in one direction. Taylor-Taylor, the group’s principle songwriter, doesn’t take the task of creating meaningful narrative lightly, either – there is always a message beneath the melody. “There’s the main line, ‘you are killing me, and everything you love about me.’ I feel like that’s a well balanced line, because it doesn’t stop at accusatory and actually finishes with a line that could open a dialogue between two people who are having a hard time in their relationship, and a hard time communicating.” The band released the song in January – breakup month – to incite that very conversation. Then there is the unmistakable Dandy groove on “STYGGO” (which stands for “Some Things You Gotta Get Over”), that tackles the bigger picture of that rapidly distorting world from a broader, birds eye view. Of the track, Taylor-Taylor says, “Some things you can’t get over. Some things you gotta get over. Distortland is the Dandy’s first record for Dine Alone, and their first studio LP since 2012’s This Machine. Though four years between releases is certainly a long time in the usual demand of the corporate world, that is not a schedule the Dandy’s ascribe to – they let the art and the music dictate, instead. That hasn’t always been a favored stance, but it’s one they stuck too.